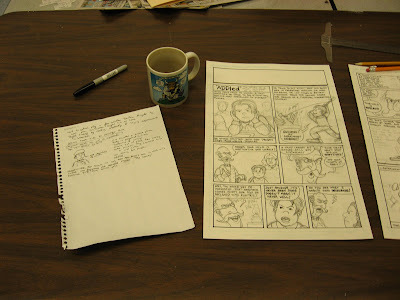 This post is a "behind-the-scenes" look at how one of my comic strips comes together. First comes the assignment. 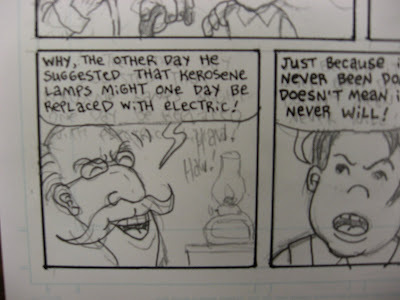 In this case, I was asked to create a three page comic strip that somehow dealt with Electricity. For three pages of comics and one page of knot instruction, I'll get $75. For the time that goes into it, it's not really worth it, but it finances the projects that I can do "just because I want to." First comes the research. It takes a lot of it! Many times I'll read and consider ideas that I don't use. 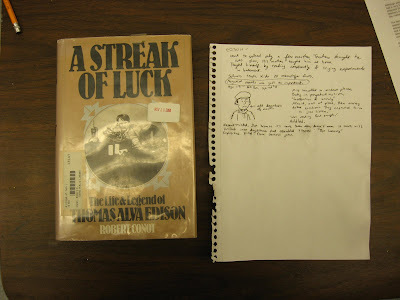 In this case, the book above inspired me to make a comic about the boyhood and career of Thomas Edison. He's a character that inspired a lot of legends and myths. Some of the biographies written for children are almost to the mythic proportions of the George Washington-cherry-tree variety. This books was intended to debunk the myths, but show what an unbelievably fascinating individual he was. Truth really is stranger than fiction. You can see in the photo above that as I read, I jotted down notes about things I considered most important, exact quotes of things that were said, or ideas that occured to me as I read. Next comes the visual research. 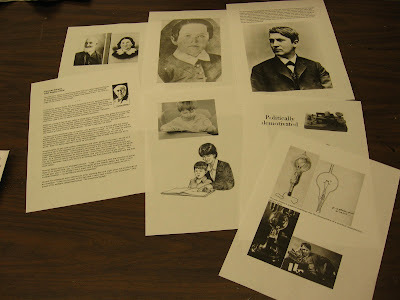 I collected images that were in the public domain to have reference material. I wanted to have the cartoon characters at least look kind of like the people they were supposed to be. I also found a few more facts from reputable sources on the internet. Because, remember, "If you steal from one person, it's plagiarism --if you steal from many people, it's research." Next comes the thumbnails. I do these in my sketchbook. This is mainly to see how many boxes it's going to take to tell the story, and how many boxes will be needed on each page. Some artists use stick figures or scribbly sketches. I mainly get the words in there. This may sound strange, but I often leave them empty because I can "see" the pictures in there. Next I sketch out the boxes with a t-square. This cheap little plastic device is a real time saver! It is also nice to have premarked comic paper. The lines are blue, so they're not reproducible. Yet they are there and one less thing I have to measure. It makes things go quite a bit faster. Next I roughly sketch what will go in each box. After that, I do the lettering, and then I come back in and tighten up the pencils. I leave the backgrounds out for the most part for now. I use Rotring lettering pens to letter. They are very handy. They come with converters that you can refill with really good ink. I would love to find a fountain pen that I could use for drawing, but I think that at this point, I like the flexible nib of Speedball tips too much. I like how the line varies as I draw. If I could find a fountain pen that made lines just like a Speedball C-6 that didn't cost too much, I'd buy it in an instant. I can't really go buying expensive pens hoping they'll have lines I like when they cost $70 plus! If anyone knows of a pen like this -- I will be forever in your debt if you'd tell me! This is the trusty Speedball (below). It's annoying to have to keep dipping, but as I said, I like the lines they make. I go all through the comic and hit the lines that this pen is needed for. Small little details I leave alone for now. Then I come in with a crowquill. I get the small details and textures with this. Then comes the erasing. This is the least enjoyable part of making comics. This is the only part of making a comic which is no fun at all! All the sketchy lines need to be erased, and there are tons of them. Just when you think you've got them all, you notice more. 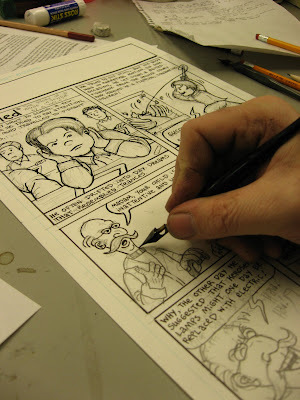 Marek Bennett teaches that making comics is easy as P.I.E. Eraser crumbs are everywhere! Or, as Marek calls them, particles of error. The big white erasers work best, I think. This one is a Papermate brand. Some artists draw in non-reproducible blue pencil, so this stage is unnecessary. Someday I'm going to have to try that. I have my suspicions, I won't like not seeing what the final art will look like until it's scan, so for now, I'm skeptical that it will work for me. I come back in with a Micron or Prismacolor marker. These are pens with very very very fine tips (even finer than a crowquill). But if you try to erase over them, the pen marks come up too! So I use them for the last finishing touches. In this case I made the backgrounds very sketchy and impressionistic. I would have loved to go into great detail with period buildings and settings, but the deadline was looming and I could only devote so much time! Then comes the scanning. I scan it in two parts, then rotate the images and put them together in Photoshop. It's not as hard as I thought it would be at one time. The computer work is not really fun for me either, but a necessary evil. 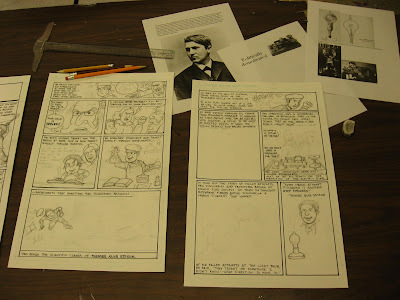 I would much rather start the next comic strip, but it's gotta be done! I enjoyed this peek behind your magic curtain, perfesser. It's always cool to see a full page of real live comics come together like that. Here's my P.I.E. page; thanks for the reference. http://en.wikipedia.org/wiki/Dust_(His_Dark_Materials) )... I get annoyed when I erase and erase, and then sweep and sweep, and even then I still find all sorts of dust in the scanned version! I have adopted a policy of blurring the scans and then boosting contrast and brightness THROUGH THE ROOF to blast out all the tiny dark dust marks. Nice tutorial, Andy. It's always interesting to see how others work. If dipping a pen is annoying, you should try inking with a brush. I think all cartoonists end up being a slave to their line. I've tried using a blue pencil to draw rough layouts and tighten it up with a regular pencil. I've also tried laying out on tracing paper and inking on a light box. Both ways save on erasing but they have their own drawbacks. Click the image above to buy this comic! Click on the image above to order your very own copy from this online store! 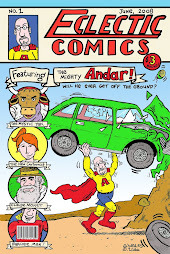 This is a great printing service if you want to print your own comic. "The creation of something new is not accomplished by the intellect, but by the play instinct -- acting from inner necessity. The creative mind plays with the objects it loves." 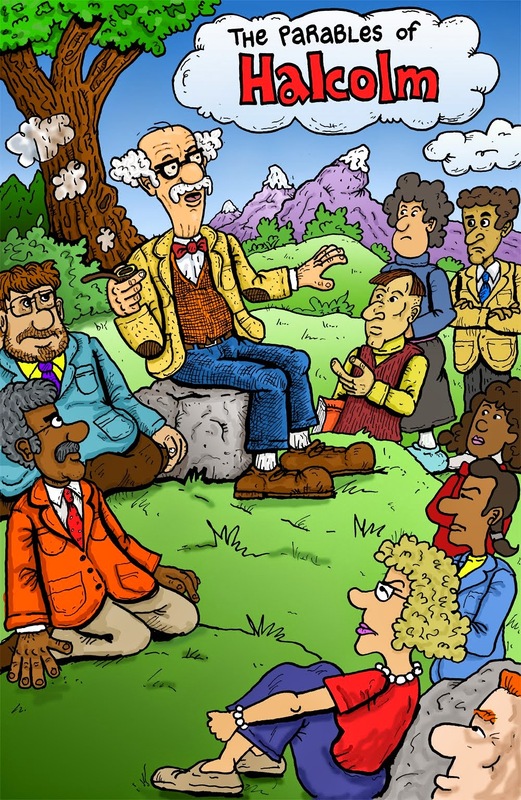 Comics by Kids -- Math Bloopers! Comic Shop Offers Super Sales!